Download the KE-15 Firearm Manual for safety and maintenance instructions. For questions about the M-LOK rail accessory system, please visit the Magpul website. 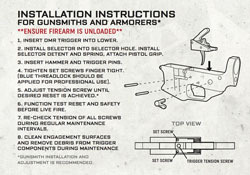 For instructions and downloadable image visit the Trigger Install Page.